For years, Penelope Kite put her unfaithful ex-husband and her ungrateful stepchildren first. Since taking early retirement from her job in forensics, she’s been an unpaid babysitter and chauffeur for her grandchildren. Now, she’s going to start living for herself. Though her dream house needs major renovations, Penelope impulsively buys the property and moves to St. Merlot. But Penelope’s daydreams didn’t include finding a corpse in her swimming pool. 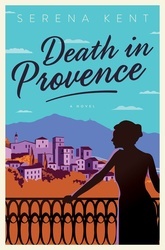 The discovery of the dead man plunges her into a Provençal stew of intrigue and lingering resentments. To find answers, she must navigate among her supercilious (and enviously chic) estate agent, the disdainful chief of police, and the devilishly handsome mayor.